If you have multiple Kodi devices at home, learning how to clone kodi devices can come in very handy. The reality today is if you are into Kodi, most have more than just one Kodi device. (including your phone). In my case, I have 8 Kodi boxes around the house: 2 Fire TV Boxes, 1 Fire Stick, 1 Nvidia Shield TV, 2 phones, 1 tablet, and 1 PC. Customizing Kodi on each of these devices from scratch can be tedious. I first build my Kodi on my PC and then transfer Kodi build from PC to Firestick, Shield TV, phones, etc. Sounds great right? 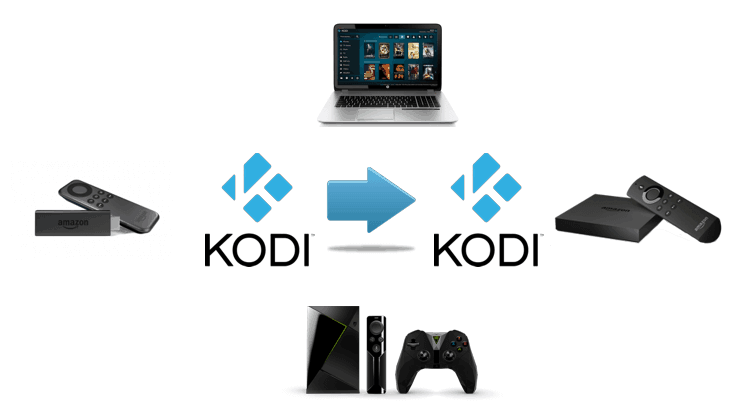 We have covered the various addons available to backup Kodi devices, in detail. We have also covered how to backup and restore Kodi profiles. But this tutorial is more than just backing up Kodi settings. It is about customizing kodi, trimming it, and duplicating Kodi setup from one device to other devices in your home. What to do after cloning Kodi from one device to another? 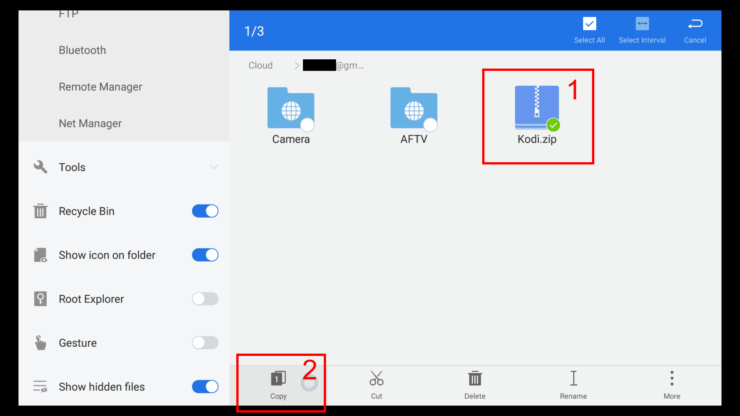 There are several different ways to duplicate Kodi setup. One way to copy Kodi setup on Fire TV devices is using adbLink, using the Backup and Restore options. 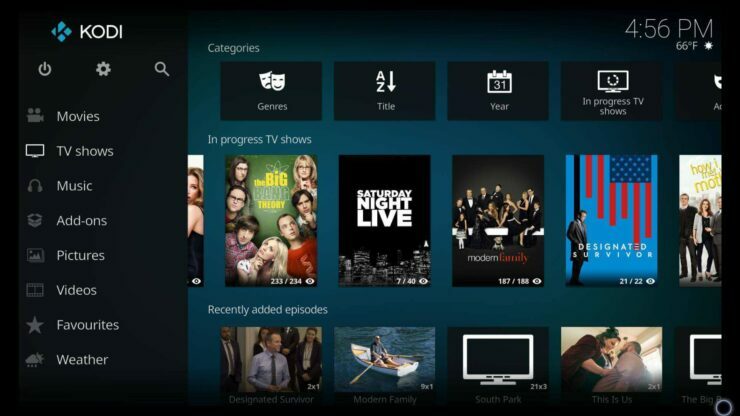 Described here is another way that should work for Fire TV, Android devices, and PC. This Kodi cloning guide may look lengthy, but it took me just about an hour to get all my Kodi devices to look the same. That's less than 10 minutes per device. So let's jump right in. Let's assume your customized Kodi build looks like what is shown in the picture below. Once have your master Kodi build setup the way you want, you are ready to clone it to other devices. But I recommend cleaning it up a bit prior to duplicating Kodi setup. For cleaning up your Kodi build, I recommend the Indigo Addon. 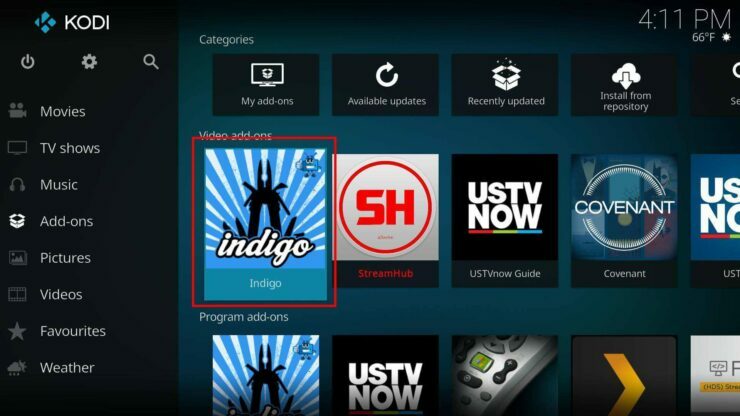 Follow our Indigo addon install guide to get it installed. Once installed, from the Addon Browser, find Indigo and open it. Then click on “Maintenance tools”. 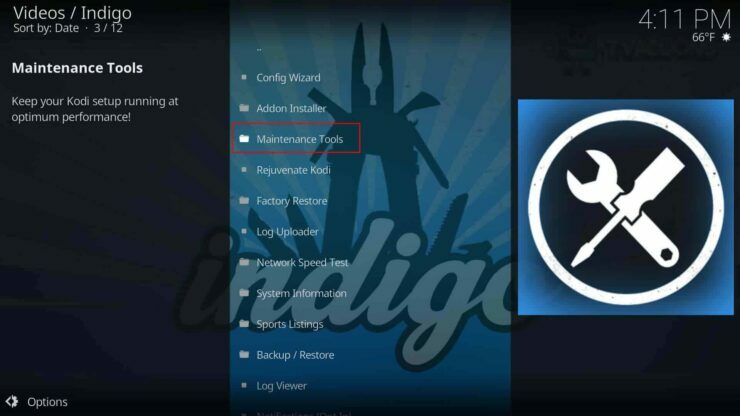 Under maintenance tools, you will find several options to clean up unwanted Kodi files. First clear Kodi cache using the “Clear Cache” option as shown below. 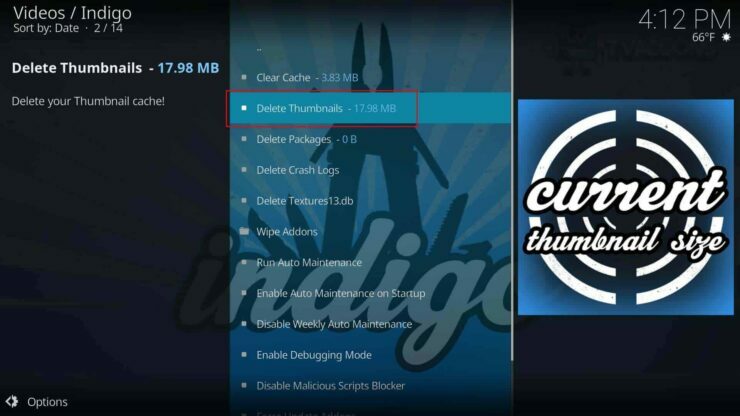 Kodi creates a thumbnail for almost anything that is pointed or selected on the interface. Over time thumbnail numbers can grow significantly. 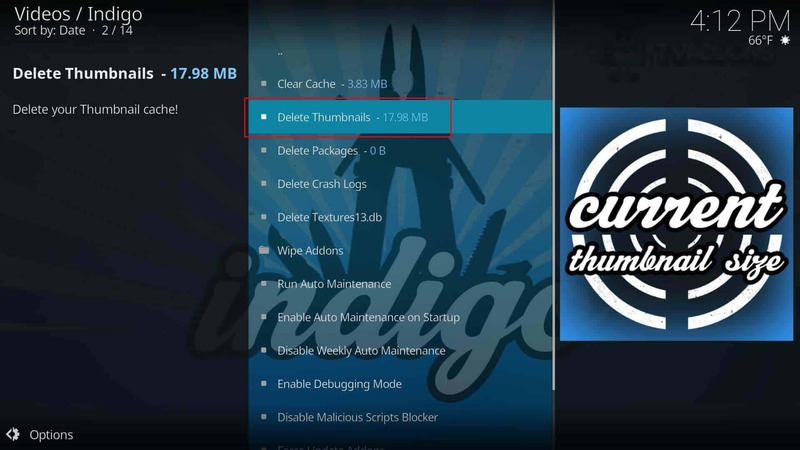 We have previously shown you how to clear Kodi thumbnail cache. But the Indigo addon makes things very easy. Just select the “Delete Thumbnails” option as shown below and voila, you are done. 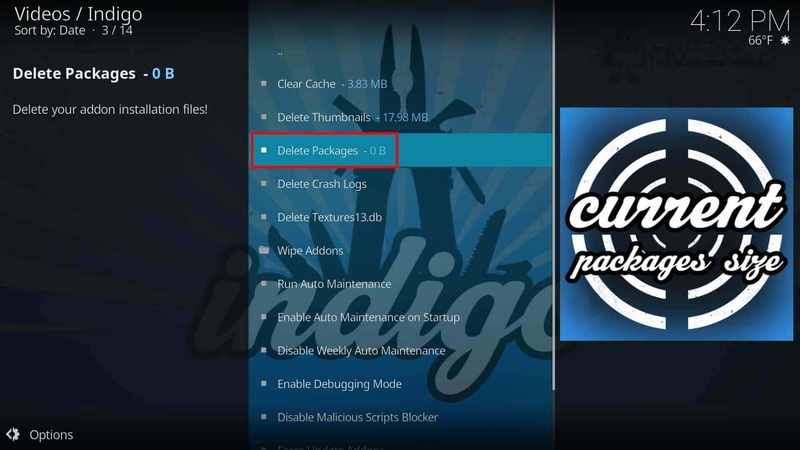 Kodi addon updates are downloaded as compressed files and stored as packages. Old addon packages can linger and fille up the space on smaller devices over time (eg. Fire TV Stick). 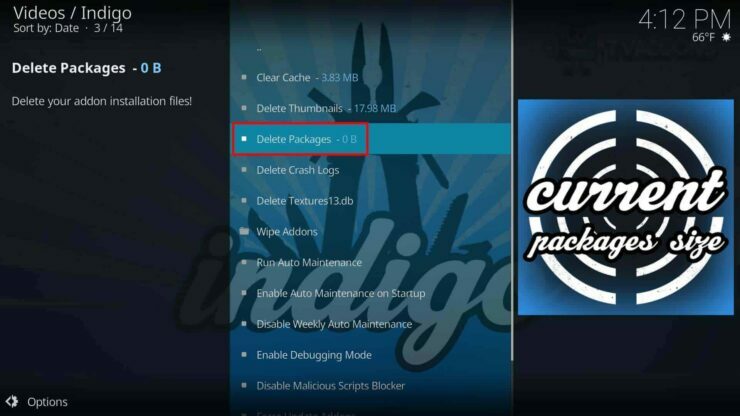 Deleting these packages is just as easy using the “Delete Packages” option shown below. In my case, I already deleted the packages prior to taking the screenshot. Otherwise, the size of the packages could be several hundred megabytes. That is it. 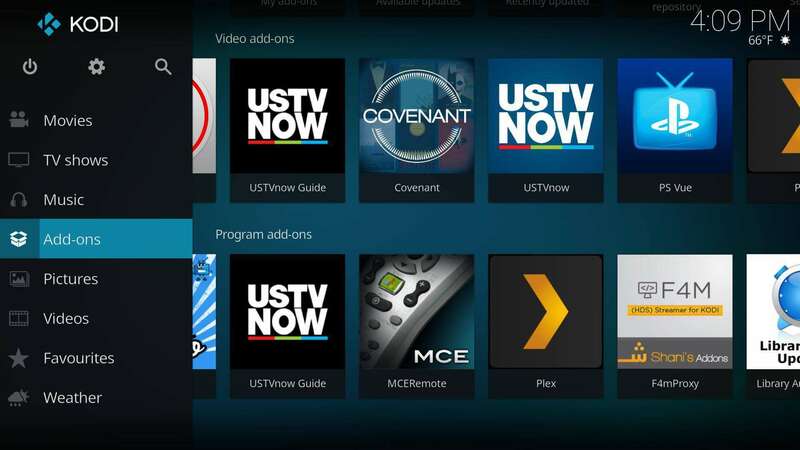 You have now cleaned up your Kodi build and are ready to copy Kodi setup to other devices. Trimming your Kodi build reduces the time needed to transfer Kodi build to another device, especially if you were doing this over Wifi. Right-click on the Kodi folder and create a compressed zip file. For this, I am using 7-zip. You may use any software that creates a zip file for you. The compressed zip file is the one that we will transfer to other Kodi instances and decompress. 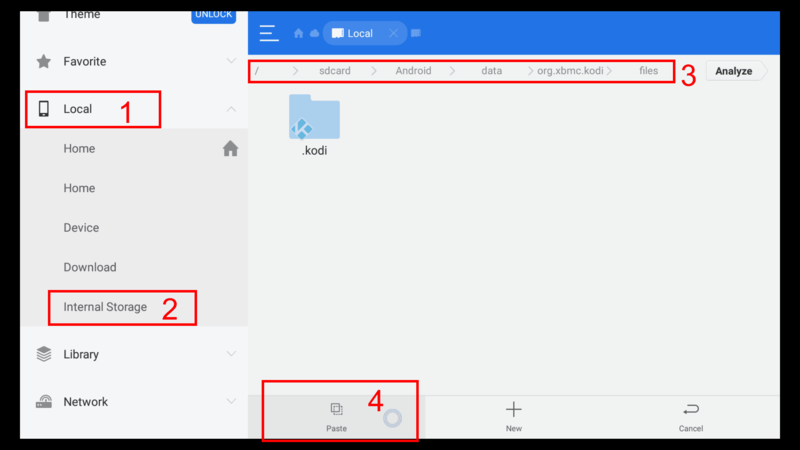 Then upload the zipped folder to a cloud service. I recommend Mediafire, which is what I used in this guide. It is free to use. 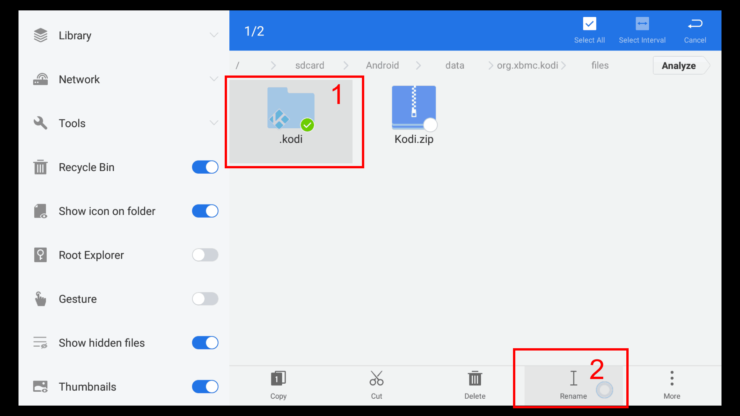 To restore Kodi backup we created in previous step, you need to locate the Kodi data folder again. This again depends on your client device. 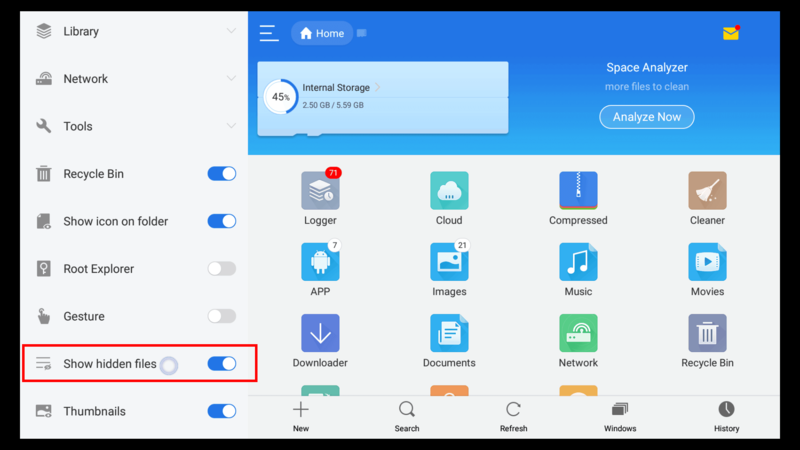 In this example, my client device is Fire TV but this procedure should work exactly for other Android devices including Shield TV. 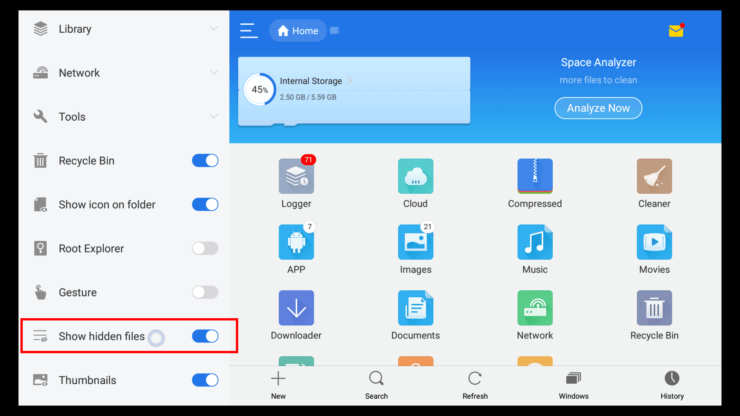 If you are in the right place and do not find the data folder, then you will have fire up Kodi at least once to find the folder. Note down the location of the folder. You do not need to do anything there right now. For the next few steps in cloning Kodi, we need a file manager that has decompress capabilities. I recommend ES file manager for this purpose. It is available for Fire TV and all android devices. On Fire TV, install ES file explorer before proceeding. 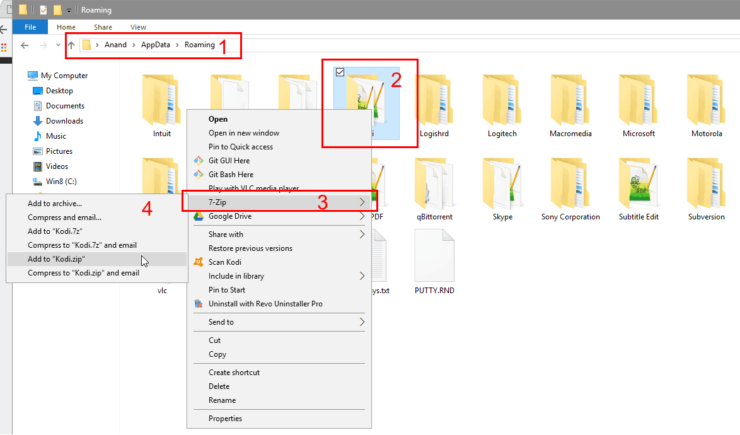 After installing, open it and scroll down the menu on the left to find and enable “Show hidden files” as shown below. 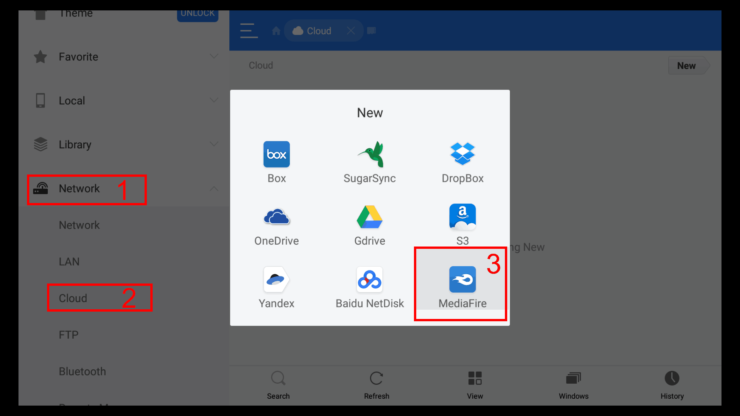 Then under Network->cloud, find Mediafire. Notice there are other cloud services listed here. You may use any of them. Enter your Mediafire credentials in the window shown below to login. Once in your Mediafire account, navigate and find your Kodi compressed folder. Long-click on it using the remote or select it using a compatible wireless keyboard/mouse, and select “Copy”. 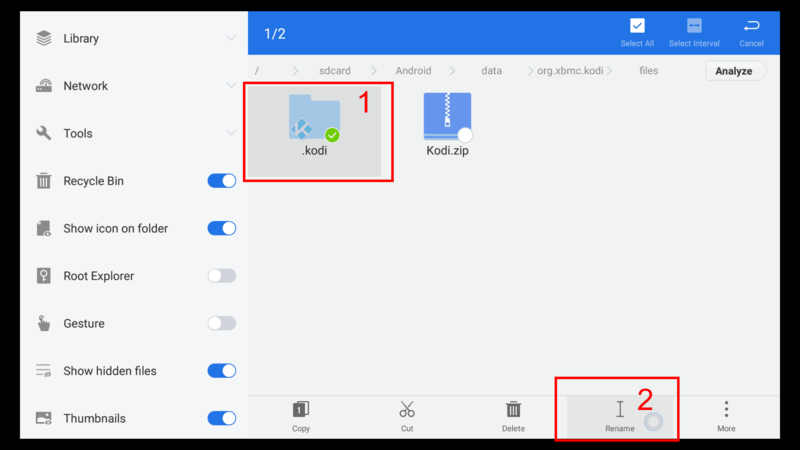 If you enabled “Show hidden files” as explained previously you will find .kodi folder here. Navigate down using your remote and press “Paste” to copy of your compressed Kodi backup file. Next, long-press the old Kodi data folder and rename it as shown below. I am calling it .kodi_default. You can call it whatever. Next, long-press on the Kodi.zip compressed backup and navigate down to “More”. Select “Extract to”. Then choose “Ccurrent path” to extract the comparessed folder. 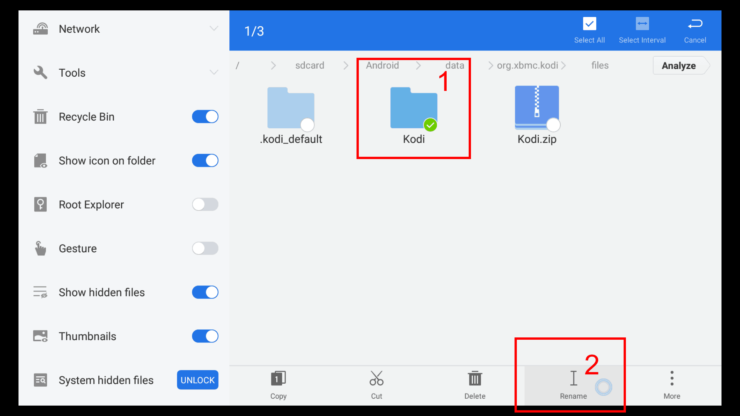 Doing so should restore the Kodi data folder from the master device to the new Kodi clone device. However, we are not done cloning yet. 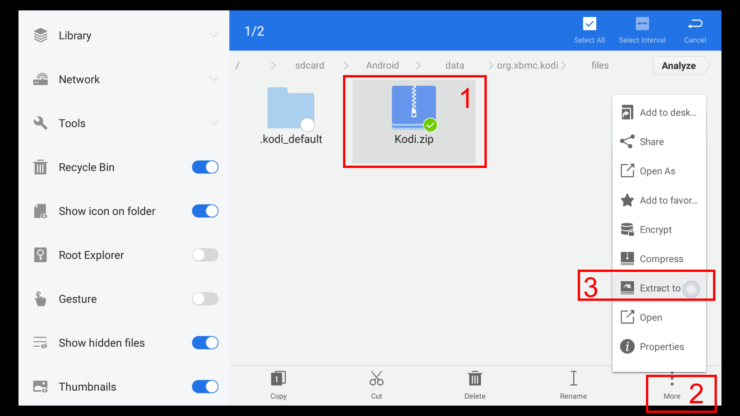 Long-press the decompressed data folder and rename it to .kodi. Do not leave out the dot in the front of the name. That is it you are done. Now its time to test it. Fire up Kodi and it should open up and look exactly like it was on the master device. It may take a few seconds for all the thumbnails to recreate but you are ready to roll now. Phew! That was a long guide on how to clone Kodi devices. But don't worry, after doing it the first time, duplicating Kodi setup to all other kodi devices should go pretty fast. Like I said, I was done cloning 8 Kodi devices in in about an hour. That is not bad at all considering how much time it saves. All of my devices share the same MySQL library database and sync watched status among them. There are other ways to share watched status or you can even disable watched status logging. If you have multiple users, you can setup Kodi profiles and clone those settings along as well.